We love talking about Quilts at the Creek. If you’d like to have us visit your guild/group contact Jane Cramer, and we’ll try to fit it into our schedule. We can promise a fun hour with a slideshow with great photos of the show, background info about the show, and of course quilts to display! Entry forms will be available starting January 1st to enter your quilt for the 2019 show, and more information about events that will be happening at the show will be posted as we finalize details, so check back here.. or better yet, sign up to follow our blog (see side bar to the right). Valerie Goodwin will be teaching workshops at Quilts at the Creek next summer- check out class descriptions here! You will also find links for class registration there too. (Registration for her trunkshow will be posted at a later date.. stay tuned!). To inspire you and get you thinking about what YOU want to work on, we will be giving you ideas from now until next summer. 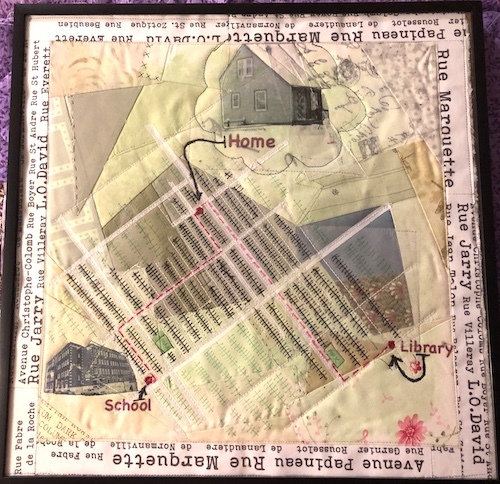 Here is a map quilt I made a while ago, about the area I grew up in in Montreal.. home, school and the local library were the centre of my universe back then.. I am hoping Valerie Goodwin’s class will help me create a less literal interpretation!